Amanda is a licensed veterinary technician who graduated from Macomb Community College in 2007 with her AAS in veterinary science. She has also nearly completed her degree in Business Management. Amanda is a member of the NAVTA, MAVT, and SEMVA and joined AEC in 2017. Amanda enjoys being a life-long learner, and thanks to her professional affiliations, she constantly benefits from the knowledge shared by her peers and experts in the field. 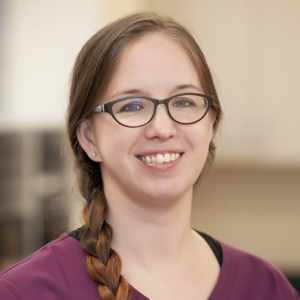 Amanda began her career doing veterinary emergency in 2008. She has also served in general practice since 2011. Client education is one of Amanda's favorite parts of the job because she believes that the best owners are well informed and knowledgable, and that her role in being a part of a trusted source for reliable information is so important. Amanda is working on becoming Fear Free Certified to help her patients have the least stressful experience in the hospital possible. "It's hard for pets being with strangers in a new environment when they already don't feel well, and sometimes it's harder still for owners to leave them in the hands of someone they may have just met. Helping both clients and patients be less afraid of the emergency room experience and to be comfortable with everything that is going on is something I make a priority." When Amanda isn't working hard at AEC, she's spending time with her husband, three kids, three dogs, and two cats. She also fosters orphaned bottle babies of various species. Amanda coaches varsity middle school basketball, cheers her kids on as they play a variety of sports, and teaches middle school Sunday School at her church.